The National Aeronautics and Space Administration (NASA, /ˈnæsə/) is an independent agency of the United States Federal Government responsible for the civilian space program, as well as aeronautics and aerospace research. NASA was established in 1958, succeeding the National Advisory Committee for Aeronautics (NACA). The new agency was to have a distinctly civilian orientation, encouraging peaceful applications in space science. 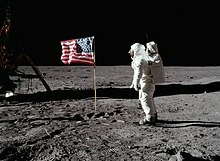 Since its establishment, most US space exploration efforts have been led by NASA, including the Apollo Moon landing missions, the Skylab space station, and later the Space Shuttle. NASA is supporting the International Space Station and is overseeing the development of the Orion Multi-Purpose Crew Vehicle, the Space Launch System and Commercial Crew vehicles. The agency is also responsible for the Launch Services Program which provides oversight of launch operations and countdown management for unmanned NASA launches. When NASA was created that same year, the Air Force program was transferred to it and renamed Project Mercury. The first seven astronauts were selected among candidates from the Navy, Air Force and Marine test pilot programs. On May 5, 1961, astronaut Alan Shepard became the first American in space aboard Freedom 7, launched by a Redstone booster on a 15-minute ballistic (suborbital) flight. 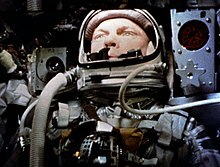 John Glenn became the first American to be launched into orbit, by an Atlas launch vehicle on February 20, 1962, aboard Friendship 7. Glenn completed three orbits, after which three more orbital flights were made, culminating in L. Gordon Cooper's 22-orbit flight Faith 7, May 15–16, 1963. Under the direction of Soviet Premier Nikita Khrushchev, the USSR competed with Gemini by converting their Vostok spacecraft into a two- or three-man Voskhod. They succeeded in launching two manned flights before Gemini's first flight, achieving a three-cosmonaut flight in 1963 and the first EVA in 1964. After this, the program was canceled, and Gemini caught up while spacecraft designer Sergei Korolev developed the Soyuz spacecraft, their answer to Apollo. On 20 missions (1983–98) the Space Shuttle carried Spacelab, designed in cooperation with the European Space Agency (ESA). Spacelab was not designed for independent orbital flight, but remained in the Shuttle's cargo bay as the astronauts entered and left it through an airlock. Another famous series of missions were the launch and later successful repair of the Hubble Space Telescope in 1990 and 1993, respectively. Long duration missions to the ISS are referred to as ISS Expeditions. Expedition crew members typically spend approximately six months on the ISS. The initial expedition crew size was three, temporarily decreased to two following the Columbia disaster. Since May 2009, expedition crew size has been six crew members. Crew size is expected to be increased to seven, the number the ISS was designed for, once the Commercial Crew Program becomes operational. The ISS has been continuously occupied for the past 18 years and 115 days, having exceeded the previous record held by Mir; and has been visited by astronauts and cosmonauts from 15 different nations. The ISS program is expected to continue until at least 2020, and may be extended beyond 2028. In response to the Apollo 1 accident which killed three astronauts in 1967, Congress directed NASA to form an Aerospace Safety Advisory Panel (ASAP) to advise the NASA Administrator on safety issues and hazards in NASA's aerospace programs. In the aftermath of the Shuttle Columbia disaster, Congress required that the ASAP submit an annual report to the NASA Administrator and to Congress. 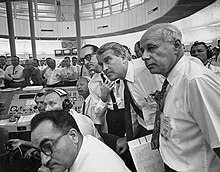 By 1971, NASA had also established the Space Program Advisory Council and the Research and Technology Advisory Council to provide the administrator with advisory committee support. In 1977, the latter two were combined to form the NASA Advisory Council (NAC). NASA also researches and publishes on climate change. Its statements concur with the global scientific consensus that the global climate is warming. 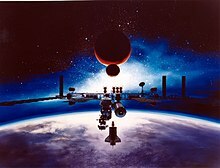 Bob Walker, who has advised the 45th President of the United States Donald Trump on space issues, has advocated that NASA should focus on space exploration and that its climate study operations should be transferred to other agencies such as NOAA. Former NASA atmospheric scientist J. Marshall Shepherd countered that Earth science study was built into NASA's mission at its creation in the 1958 National Aeronautics and Space Act. NASA's facilities are research, construction and communication centers to help its missions. Some facilities serve more than one application for historic or administrative reasons. NASA also operates a short-line railroad at the Kennedy Space Center and uses special aircraft. John F. Kennedy Space Center (KSC), is one of the best-known NASA facilities. It has been the launch site for every United States human space flight since 1968. Although such flights are currently on pause, KSC continues to manage and operate unmanned rocket launch facilities for America's civilian space program from three pads at the adjoining Cape Canaveral Air Force Station. ↑ NASA is an independent agency that is not a part of any executive department but reports directly to the President. ↑ The descend stage of the LM stayed on the Moon after landing while the ascend stage brought the two astronauts back to the CSM and then fell back to the Moon. ↑ From left to right: Launch vehicle of Apollo (Saturn 5), Gemini (Titan 2) and Mercury (Atlas). Left, top-down: Spacecraft of Apollo, Gemini and Mercury. The Saturn IB and Mercury-Redstone launch vehicles are left out. ↑ US Centennial of Flight Commission, NACA. centennialofflight.net. Retrieved on November 3, 2011. ↑ Lale Tayla & Figen Bingul (2007). "NASA stands 'for the benefit of all. '—Interview with NASA's Dr. Süleyman Gokoglu". The Light Millennium. Retrieved 17 September 2018. ↑ "Workforce Profile". NASA. Retrieved 17 September 2018. ↑ "Trump, Congress approve largest U.S. research spending increase in a decade". Science AAAS. March 23, 2018. Retrieved March 24, 2018. ↑ "Official US Executive Branch Web Sites – Newspaper and Current Periodical Reading Room (Serial and Government Publications Division, Library of Congress)". loc.gov. Retrieved May 24, 2016. ↑ "Frequently Asked Questions". hq.nasa.gov. Retrieved May 24, 2016. ↑ "Ike in History: Eisenhower Creates NASA". Eisenhower Memorial. 2013. Retrieved November 27, 2013. ↑ "The National Aeronautics and Space Act". NASA. 2005. Retrieved August 29, 2007. 1 2 Bilstein, Roger E. (1996). "From NACA to NASA". NASA SP-4206, Stages to Saturn: A Technological History of the Apollo/Saturn Launch Vehicles. NASA. pp. 32–33. ISBN 978-0-16-004259-1. Retrieved May 6, 2013. ↑ Netting, Ruth (June 30, 2009). "Earth—NASA Science". Archived from the original on July 16, 2009. Retrieved July 15, 2009. ↑ Netting, Ruth (January 8, 2009). "Heliophysics—NASA Science". Archived from the original on July 16, 2009. Retrieved July 15, 2009. ↑ Roston, Michael (August 28, 2015). "NASA's Next Horizon in Space". New York Times. Retrieved August 28, 2015. ↑ Netting, Ruth (July 13, 2009). "Astrophysics—NASA Science". Archived from the original on July 16, 2009. Retrieved July 15, 2009. ↑ "The NACA, NASA, and the Supersonic-Hypersonic Frontier" (PDF). NASA. Retrieved September 30, 2011. 1 2 Erickson, Mark (2005). Into the Unknown Together—The DOD, NASA, and Early Spaceflight (PDF). ISBN 978-1-58566-140-4. Archived from the original (PDF) on September 20, 2009. ↑ Subcommittee On Military Construction, United States. Congress. Senate. Committee on Armed Services (January 21–24, 1958). 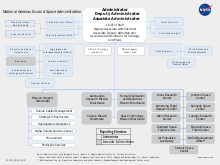 Supplemental military construction authorization (Air Force). : Hearings, Eighty-fifth Congress, second session, on H.R. 9739. 1 2 3 "T. KEITH GLENNAN". NASA. August 4, 2006. Retrieved July 15, 2009. ↑ von Braun, Werner (1963). "Recollections of Childhood: Early Experiences in Rocketry as Told by Werner Von Braun 1963". MSFC History Office. NASA Marshall Space Flight Center. Retrieved July 15, 2009. ↑ Van Atta, Richard (April 10, 2008). "50 years of Bridging the Gap" (PDF). Archived from the original (PDF) on February 24, 2009. Retrieved July 15, 2009. ↑ Heppenheimer, T. A. (1999). "3. Mars and Other Dream Worlds". SP-4221 The Space Shuttle Decision. Washington DC: NASA. p. 115. Retrieved August 22, 2018. ↑ Administrator, NASA Content (January 30, 2017). "Robert M. Lightfoot Jr., Acting Administrator". 1 2 Fouriezos, Nick (May 30, 2016). "Your Presidential Candidates ... For the Milky Way". OZY. Retrieved May 30, 2016. ↑ "T. Keith Glennan biography". NASA. August 4, 2006. Retrieved July 5, 2008. ↑ Cabbage, Michael (July 15, 2009). "Bolden and Garver Confirmed by U.S. Senate" (Press release). NASA. Archived from the original on October 28, 2009. Retrieved July 16, 2009. ↑ Shouse, Mary (July 9, 2009). "Welcome to NASA Headquarters". Retrieved July 15, 2009. ↑ The Air Force definition of outer space differs from that of the International Aeronautical Federation, which is 100 kilometers (330,000 ft). 1 2 Aerospaceweb, North American X-15. Aerospaceweb.org. Retrieved on November 3, 2011. ↑ Aircraft Museum X-15." Aerospaceweb.org, November 24, 2008. ↑ Swenson Jr., Loyd S.; Grimwood, James M.; Alexander, Charles C. (1989). "11-4 Shepard's Ride". In Woods, David; Gamble, Chris. This New Ocean: A History of Project Mercury (url). Published as NASA Special Publication-4201 in the NASA History Series. NASA. Retrieved July 14, 2009. ↑ Swenson Jr., Loyd S.; Grimwood, James M.; Alexander, Charles C. (1989). "13-4 An American in Orbit". In Woods, David; Gamble, Chris. This New Ocean: A History of Project Mercury (url). Published as NASA Special Publication-4201 in the NASA History Series. NASA. Retrieved July 14, 2009. ↑ "Mercury Manned Flights Summary". NASA. Retrieved October 9, 2011. ↑ "NASA history, Gagarin". NASA. Retrieved October 9, 2011. ↑ Barton C. Hacker; James M. Grimwood (December 31, 2002). "10-1 The Last Hurdle". On the Shoulders of Titans: A History of Project Gemini (url). NASA. ISBN 978-0-16-067157-9. Archived from the original on February 1, 2010. Retrieved July 14, 2009. ↑ Barton C. Hacker; James M. Grimwood (December 31, 2002). "12-5 Two Weeks in a Spacecraft". On the Shoulders of Titans: A History of Project Gemini. NASA. ISBN 978-0-16-067157-9. Archived from the original on February 1, 2010. Retrieved July 14, 2009. ↑ Barton C. Hacker; James M. Grimwood (December 31, 2002). "13-3 An Alternative Target". On the Shoulders of Titans: A History of Project Gemini. NASA. ISBN 978-0-16-067157-9. Archived from the original on February 1, 2010. Retrieved July 14, 2009. ↑ Butts, Glenn; Linton, Kent (April 28, 2009). "The Joint Confidence Level Paradox: A History of Denial, 2009 NASA Cost Symposium" (PDF). pp. 25–26. Archived from the original (PDF) on October 26, 2011. ↑ Nichols, Kenneth David (1987). The Road to Trinity: A Personal Account of How America's Nuclear Policies Were Made, pp 34–35. New York: William Morrow and Company. ISBN 978-0-688-06910-0. OCLC 15223648. ↑ "Saturn V". Encyclopedia Astronautica. Archived from the original on October 7, 2011. Retrieved October 13, 2011. ↑ "Apollo 8: The First Lunar Voyage". NASA. Retrieved October 13, 2011. ↑ Siddiqi, Asif A. (2003). The Soviet Space Race with Apollo. Gainesville: University Press of Florida. pp. 654–656. ISBN 978-0-8130-2628-2. ↑ "Apollo 9: Earth Orbital trials". NASA. Retrieved October 13, 2011. ↑ "Apollo 10: The Dress Rehearsal". NASA. Retrieved October 13, 2011. ↑ "The First Landing". NASA. Retrieved October 13, 2011. ↑ Chaikin, Andrew (March 16, 1998). A Man on the Moon. New York: Penguin Books. ISBN 978-0-14-027201-7. 1 2 3 Belew, Leland F., ed. (1977). Skylab Our First Space Station—NASA report (PDF). NASA. NASA-SP-400. Retrieved July 15, 2009. 1 2 Benson, Charles Dunlap and William David Compton. Living and Working in Space: A History of Skylab. NASA publication SP-4208. ↑ Gatland, Kenneth (1976). Manned Spacecraft, Second Revision. New York: Macmillan Publishing Co., Inc. p. 247. ISBN 978-0-02-542820-1. ↑ Grinter, Kay (April 23, 2003). "The Apollo Soyuz Test Project". Archived from the original on July 25, 2009. Retrieved July 15, 2009. ↑ Bernier, Serge (May 27, 2002). Space Odyssey: The First Forty Years of Space Exploration. Cambridge University Press. ISBN 978-0-521-81356-3. 1 2 Watson, Traci (January 8, 2008). "Shuttle delays endanger space station". USA Today. Retrieved July 15, 2009. ↑ "NASA's Last Space Shuttle Flight Lifts Off From Cape Canaveral". KHITS Chicago. July 8, 2011. Archived from the original on July 14, 2011. 1 2 John E. Catchpole (June 17, 2008). The International Space Station: Building for the Future. Springer-Praxis. ISBN 978-0-387-78144-0. ↑ "Human Spaceflight and Exploration—European Participating States". European Space Agency (ESA). 2009. Retrieved January 17, 2009. ↑ Gary Kitmacher (2006). Reference Guide to the International Space Station. Canada: Apogee Books. pp. 71–80. ISBN 978-1-894959-34-6. ISSN 1496-6921. ↑ Gerstenmaier, William (October 12, 2011). "Statement of William H. Gerstenmaier Associate Administrator for HEO NASA before the Subcommittee on Space and Aeronautics Committee on Science, Space and Technology U. S. House of Representatives" (PDF). United States House of Representatives. Retrieved August 31, 2012. ↑ Afanasev, Igor; Vorontsov, Dmitrii (January 11, 2012). "The Russian ISS segment is to be completed by 2016". Air Transport Observer. Retrieved October 14, 2012. 1 2 "ISS Intergovernmental Agreement". European Space Agency (ESA). April 19, 2009. Archived from the original on June 10, 2009. Retrieved April 19, 2009. ↑ "Memorandum of Understanding Between the National Aeronautics and Space Administration of the United States of America and the Russian Space Agency Concerning Cooperation on the Civil International Space Station". NASA. January 29, 1998. Retrieved April 19, 2009. ↑ Zak, Anatoly (October 15, 2008). "Russian Segment: Enterprise". RussianSpaceWeb. Retrieved August 4, 2012. ↑ "ISS Fact sheet: FS-2011-06-009-JSC" (PDF). NASA. 2011. Retrieved September 2, 2012. ↑ "MCB Joint Statement Representing Common Views on the Future of the ISS" (PDF). International Space Station Multilateral Coordination Board. February 3, 2010. Retrieved August 16, 2012. ↑ Leone, Dan (June 20, 2012). "Wed, 20 June, 2012 NASA Banking on Commercial Crew To Grow ISS Population". Space News. Retrieved September 1, 2012. ↑ "Nations Around the World Mark 10th Anniversary of International Space Station". NASA. November 17, 2008. Retrieved March 6, 2009. ↑ Boyle, Rebecca (November 11, 2010). "The International Space Station Has Been Continuously Inhabited for Ten Years Today". Popular Science. Retrieved September 1, 2012. ↑ Chow, Denise (November 17, 2011). "U.S. Human Spaceflight Program Still Strong, NASA Chief Says". Space.com. Retrieved July 2, 2012. ↑ Potter, Ned (July 17, 2009). "Space Shuttle, Station Dock: 13 Astronauts Together". ABC News. Retrieved September 7, 2012. ↑ Leone, Dan (March 29, 2012). "Sen. Mikulski Questions NASA Commercial Crew Priority". Space News. Retrieved June 30, 2012. ↑ "NASA Selects Crew and Cargo Transportation to Orbit Partners" (Press release). NASA. August 18, 2006. Retrieved November 21, 2006. 1 2 "Moving Forward: Commercial Crew Development Building the Next Era in Spaceflight" (PDF). Rendezvous. NASA. 2010. pp. 10–17. Retrieved February 14, 2011. Just as in the COTS projects, in the CCDev project we have fixed-price, pay-for-performance milestones" Thorn said. "There's no extra money invested by NASA if the projects cost more than projected. ↑ McAlister, Phil (October 2010). "The Case for Commercial Crew" (PDF). NASA. Retrieved July 2, 2012. ↑ "NASA Awards Space Station Commercial Resupply Services Contracts". NASA, December 23, 2008. ↑ "Space Exploration Technologies Corporation – Press". Spacex.com. Archived from the original on July 21, 2009. Retrieved July 17, 2009. ↑ Clark, Stephen (June 2, 2012). "NASA expects quick start to SpaceX cargo contract". SpaceFlightNow. Retrieved June 30, 2012. ↑ Bergin, Chris (September 28, 2013). "Orbital's Cygnus successfully berthed on the ISS". NASASpaceFlight.com (not affiliated with NASA). Retrieved October 17, 2013. ↑ "SpaceX/NASA Discuss launch of Falcon 9 rocket and Dragon capsule". NASA. May 22, 2012. Retrieved June 23, 2012. ↑ Berger, Brian (February 1, 2011). "Biggest CCDev Award Goes to Sierra Nevada". Imaginova Corp. Retrieved December 13, 2011. ↑ Morring, Frank (October 10, 2012). "Boeing Gets Most Money With Smallest Investment". Aviation Week. Retrieved October 5, 2012. ↑ Dean, James (April 18, 2011). "NASA awards $270 million for commercial crew efforts". space.com. Archived from the original on April 19, 2011. Retrieved May 11, 2011. ↑ "NASA Announces Next Steps in Effort to Launch Americans from U.S. Soil". NASA. August 3, 2012. Retrieved August 3, 2012. ↑ Bolden, Charlie. "American Companies Selected to Return Astronaut Launches to American Soil". NASA.gov. Retrieved September 16, 2014. ↑ Foust, Jeff (September 19, 2014). "NASA Commercial Crew Awards Leave Unanswered Questions". Space News. Retrieved September 21, 2014. We basically awarded based on the proposals that we were given," Kathy Lueders, NASA commercial crew program manager, said in a teleconference with reporters after the announcement. "Both contracts have the same requirements. The companies proposed the value within which they were able to do the work, and the government accepted that. ↑ Lewis, Marie (November 21, 2018). "NASA's Commercial Crew Program Target Test Flight Dates". NASA.gov. NASA. Retrieved November 29, 2018. ↑ Achenbach, Joel (February 1, 2010). "NASA budget for 2011 eliminates funds for manned lunar missions". Washington Post. Retrieved February 1, 2010. 1 2 "President Barack Obama on Space Exploration in the 21st Century". Office of the Press Secretary. April 15, 2010. Retrieved July 4, 2012. 1 2 "Today – President Signs NASA 2010 Authorization Act". Universetoday.com. Retrieved November 20, 2010. ↑ Svitak, Amy (March 31, 2011). "Holdren: NASA Law Doesn't Square with Budgetary Reality". Space News. Retrieved July 4, 2012. 1 2 "Bill Text – 111th Congress (2009–2010) – THOMAS (Library of Congress)". loc.gov. ↑ "NASA Announces Design for New Deep Space Exploration System". NASA. September 14, 2011. Retrieved April 28, 2012. 1 2 3 4 Bergin, Chris (February 23, 2012). "Acronyms to Ascent – SLS managers create development milestone roadmap". NASA. Retrieved April 29, 2012. ↑ NASA Sets New Roadmap for Moon Base, Crewed Missions to Mars Extreme Tech. By Ryan Whitwam. Sep. 27, 2018. Downloaded Nov. 26, 2018. 1 2 Grady, Mary (June 5, 2016). "NASA and DARPA plan to release new X-Planes". Yahoo Tech. Retrieved June 8, 2016. ↑ "NASA builds deep space habitats on Earth". Retrieved December 30, 2016. 1 2 "US Government Issues NASA Demand, 'Get Humans to Mars By 2033'". March 9, 2017. ↑ "Trump Signs NASA Authorization act of 2017". Spaceflight Insider. March 21, 2017. Retrieved December 2, 2018. ↑ "Launch History (Cumulative)" (PDF). NASA. Retrieved September 30, 2011. ↑ "NASA Experimental Communications Satellites, 1958–1995". NASA. Retrieved September 30, 2011. ↑ "NASA, Explorers program". NASA. Retrieved September 20, 2011. ↑ "JPL, Chapter 4. Interplanetary Trajectories". NASA. Retrieved September 30, 2011. ↑ "Missions to Mars". The Planet Society. Retrieved September 30, 2011. ↑ "Missions to Jupiter". The Planet Society. Retrieved September 30, 2011. ↑ "JPL Voyager". JPL. Retrieved September 30, 2011. ↑ "Pioneer 10 spacecraft send last signal". NASA. Retrieved September 30, 2011. ↑ "The golden record". JPL. Retrieved September 30, 2011. ↑ "New Horizon". JHU/APL. Archived from the original on May 9, 2010. Retrieved September 30, 2011. ↑ "Voyages Beyond the Solar System: The Voyager Interstellar Mission". NASA. Retrieved September 30, 2011. ↑ NASA Staff (November 26, 2011). "Mars Science Laboratory". NASA. Retrieved November 26, 2011. ↑ "NASA Launches Super-Size Rover to Mars: 'Go, Go!'". New York Times. Associated Press. November 26, 2011. Retrieved November 26, 2011. ↑ Kenneth Chang (August 6, 2012). "Curiosity Rover Lands Safely on Mars". The New York Times. Retrieved August 6, 2012. 1 2 Wilson, Jim (September 15, 2008). "NASA Selects 'MAVEN' Mission to Study Mars Atmosphere". NASA. Retrieved July 15, 2009. ↑ NASA Office of Public Affairs (December 4, 2006). "GLOBAL EXPLORATION STRATEGY AND LUNAR ARCHITECTURE" (PDF). NASA. Retrieved July 15, 2009. ↑ "Review of United States Human Space Flight Plans Committee" (PDF). Office of Science and Technology Policy. October 22, 2009. Retrieved December 13, 2011. ↑ Goddard, Jacqui (February 2, 2010). "Nasa reduced to pipe dreams as Obama cancels Moon flights". The Times. London. Retrieved May 19, 2010. ↑ "NASA Strategic Plan, 2011" (PDF). NASA Headquarters. ↑ Boyle, Rebecca (June 5, 2012). "NASA Adopts Two Spare Spy Telescopes, Each Maybe More Powerful than Hubble". Popular Science. Popular Science Technology Group. Retrieved June 5, 2012. ↑ "NASA Announces Design for New Deep Space Exploration System". NASA. September 14, 2011. Retrieved December 13, 2011. ↑ "NASA's Orion Flight Test Yields Critical Data". NASA. ↑ Billings, Lee. 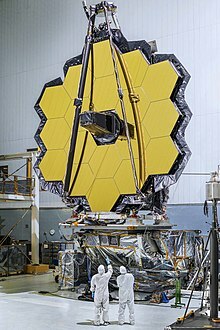 "NASA's James Webb Space Telescope Slips to 2020, and Astronomy Suffers". Scientific American. Retrieved April 20, 2018. ↑ JPL, NASA. "First Recorded Voice from Mars". nasa.gov. 1 2 3 4 "Trump just signed a law that maps out NASA's long-term future — but a critical element is missing". ↑ Ledyard King (March 16, 2017). "Trump's NASA budget preserves Mars mission, cuts Earth science, asteroid trip, education". USA Today. ↑ SCS (August 23, 2018). "Sensor Coating Systems launches new national aerospace project with NATEP and some leading international players". ↑ Chang, Kenneth (December 31, 2018). "New Horizons Spacecraft Completes Flyby of Ultima Thule, the Most Distant Object Ever Visited". The New York Times. Retrieved January 1, 2019. ↑ "OSIRIS-REx Factsheet" (PDF). NASA/Explorers and Heliophysics Projects Division. August 2011. ↑ mars.nasa.gov. "Overview – Mars 2020 Rover". mars.jpl.nasa.gov. Retrieved 2018-10-30. ↑ Faust, Jeff (28 March 2018). "WFIRST work continues despite budget and schedule uncertainty". Retrieved 17 September 2018. ↑ "NASA Aerospace Safety Advisory Panel (ASAP)". oiir.hq.nasa.gov. ↑ Mochinski, Ron (April 8, 2015). "About Us – Background and Charter". 1 2 3 4 "President Trump Directs NASA to Return to the Moon, Then Aim for Mars". ↑ Jeff Foust (June 14, 2017). "NASA closing out Asteroid Redirect Mission". Space News. Retrieved September 9, 2017. ↑ Amos, Jonathan (February 1, 2010). "Obama cancels Moon return project". BBC News. Retrieved March 7, 2010. ↑ "Terminations, Reductions, and Savings" (PDF). Archived from the original (PDF) on August 11, 2010. Retrieved March 7, 2010. ↑ "Fiscal Year 2011 Budget Estimates" (PDF). Archived from the original (PDF) on February 1, 2010. Retrieved March 7, 2010. ↑ Garber, Todd Messer, Claire Rojstaczer, and Steve. "Reagan ISS". history.nasa.gov. ↑ "US Government Issues NASA Demand, 'Get Humans to Mars By 2033'". Futurism. March 9, 2017. Retrieved February 16, 2018. ↑ "Text of Remarks at Signing of Trump Space Policy Directive 1 and List of Attendees", Marcia Smith, Space Policy Online, 11 December 2017, accessed 21 August 2018. ↑ Bridenstine Speaks at NASA Advisory Council Meeting, at 4:40, NASA TV, 29 August 2018, accessed 1 September 2018. ↑ "Radioisotope Power Systems for Space Exploration" (PDF). March 2011. Retrieved March 13, 2015. 1 2 "New Horizons II Final Report – March 2005" (PDF). ↑ "Cubes in Space". www.cubesinspace.com. Retrieved July 1, 2017. ↑ "MSFC_Fact_sheet" (PDF). NASA. Retrieved October 1, 2011. ↑ Rogers, Simon. (February 1, 2010) Nasa budgets: US spending on space travel since 1958 |Society. theguardian.com. Retrieved on August 26, 2013. ↑ "Fiscal Year 2013 Budget Estimates" (PDF). NASA. Retrieved February 13, 2013. ↑ "Past, Present, and Future of NASA — U.S. Senate Testimony". Hayden Planetarium. March 7, 2012. Retrieved December 4, 2012. ↑ "Past, Present, and Future of NASA — U.S. Senate Testimony (Video)". Hayden Planetarium. March 7, 2012. Retrieved December 4, 2012. ↑ Launius, Roger D. "Public opinion polls and perceptions of US human spaceflight". Division of Space History, National Air and Space Museum, Smithsonian Institution. ↑ Clark, Stephen (December 14, 2014). 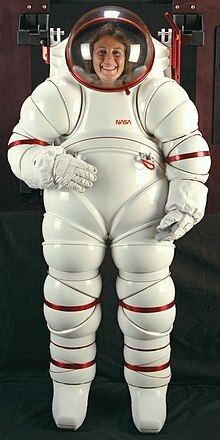 "NASA gets budget hike in spending bill passed by Congress". Spaceflight Now. Retrieved December 15, 2014. ↑ Staff, Science News. "Updated: Congress approves largest U.S. research spending increase in a decade". Science. American Association for the Advancement of Science. Retrieved March 23, 2018. 1 2 Foust, Jeff. "NASA receives $20.7 billion in omnibus appropriations bill". Space News. Retrieved March 23, 2018. ↑ "Rocket Soot Emissions and Climate Change". The Aerospace Corporation. July 31, 2013. Archived from the original on July 7, 2014. Retrieved January 7, 2014. ↑ "Spaceflight Now – Dragon Mission Report – Mission Status Center". Retrieved July 4, 2015. ↑ "Space Shuttle Main Engines". NASA. July 16, 2009. Retrieved January 20, 2015. ↑ "Constellation Programmatic Environmental Impact Statement". NASA. August 1, 2011. Retrieved June 19, 2014. ↑ Shiga, David (September 28, 2007). "Next-generation ion engine sets new thrust record". New Scientist. Retrieved February 2, 2011. ↑ Goto, T; Nakata Y; Morita S (2003). "Will xenon be a stranger or a friend? : the cost, benefit, and future of xenon anesthesia". Anesthesiology. 98 (1): 1–2. doi:10.1097/00000542-200301000-00002. PMID 12502969. Archived from the original on August 11, 2011. Retrieved September 15, 2010. ↑ Michael K. Ewert (2006). "Johnson Space Center's Role in a Sustainable Future" (PDF). NASA. Archived from the original (PDF) on May 27, 2008. Retrieved April 28, 2008. ↑ "NASA – NASA's New Building Awarded the U.S. Green Building Council LEED Gold Rating". nasa.gov.